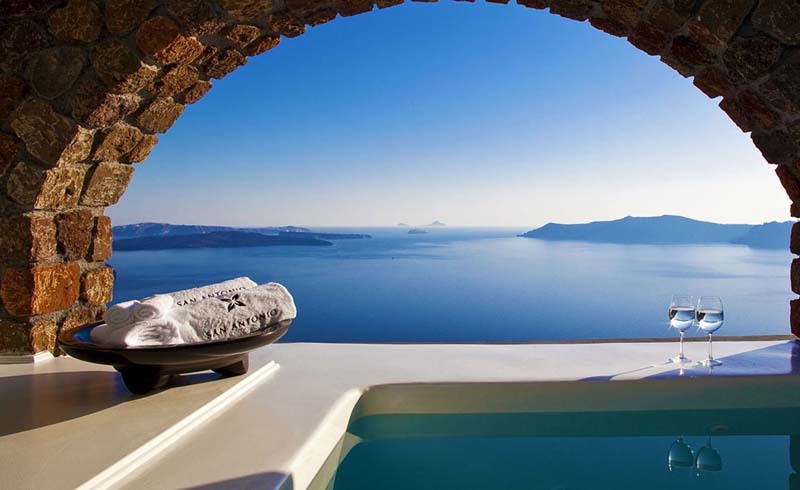 Santorini's luxury boutique hotels have a ringside seat to one of the most dramatic seascapes in the world. The island is arguably the most photogenic of all the Cyclades, the white washed Greek island group of the southern Aegean. Villages of boxy white houses and white painted caves cling to tops of 1,000 foot cliffs, the rim of a lava-stained caldera, like seven-minute icing on a Christmas fruitcake. The whole island is actually a huge, dormant but still active volcano, its cliffs the boundaries of a lagoon. And in the center, a blackened island, Nea Kameni, is the surface evidence of that "dormant" volcano, still belching sulphur into the sea. With plains that slope away to beaches to the west, behind the cliffs, one wonders why so may gorgeous settlements, filled with expensive, luxury hotels, restaurants and shops, choose to spread across the rim and slopes of the volcanic caldera. Perhaps it's that volcano. Best keep an eye on it. More than 4,000 years ago its eruption destroyed the Minoan civilization — here and on Crete. And it erupted three times in the 20th century, most recently in 1950. Meanwhile, you can live it up in champagne style at these five glorious hotels. Despite their superficial identikit looks, Santorini's luxury hotels come in a surprising variety of shapes and sizes each with its own unique features. A very high staff to guest ratio resulting in attentive and patient service. Free, relatively reliable wi-fi and international cable television if you can't tear yourself away from the news. Romantic, indulgent privacy. Even when the island is crowded with day trippers from the twice weekly visits of cruise ships, guests at these boutique hotels can be in a world of their own. There is no getting away from the fact that most of these hotels are pricey by anyone's standards. But they provide memorable, once-in-a-lifetime experiences for honeymoons, anniversaries and special, romantic getaways. And a note about the steps: Santorini is essentially the shell of a mountain and access to its Caldera hotels often involves negotiating long or zigzag flights of stairs, frequently without handrails. Most that we visited are not suitable for visitors with mobility issues. Early inhabitants of Santorini — mostly visiting fisherman seeking shelter from rough weather and Venetian merchants storing their goods -- occupied the caves on the face of the caldera, some naturally occurring and most dug out of the volcanic basalt to suit their requirements. Over time, villages of caves (some as dwellings, others as shops and workshops) grew up. Iconic Santorini occupies some of these. The hotel's units range from two to three room suites. Each unit has a generous, sun-washed terrace with loungers, table and chairs, umbrellas for shade and a constantly changing view of Nea Kameni. Breakfast is laid out here, at a time you request, and the gentle ring of the bedside phone wakes you to tell you it has arrived. While dawdling over an enormous breakfast of fruits, breads, meats, cheeses and eggs, we watched the yellowish current from the volcanic hot springs spread from the islet in a thin stream across the lagoon. Multi-decked cruise ships and giant sea-going ferries crisscrossed below, shrunk to the size of pond skaters by our elevation. 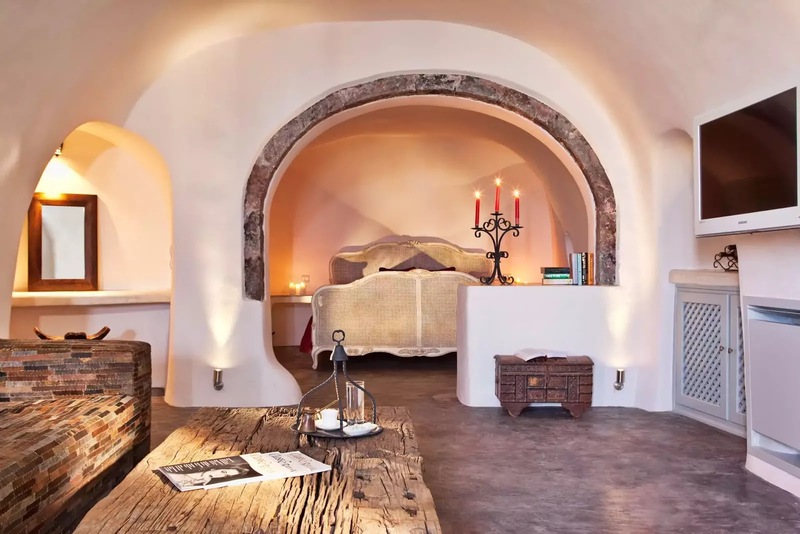 Each well-equipped suite is made up of plastered and white washed caves with plenty of lighting to make up for minimal windows. Rather than seeming claustrophobic, the large caves provide a cool respite from Santorini's relentless, blazing sun. Our suite was furnished with a huge comfortable bed, full size sofa and table, a desk and chair under a flat screen television, and a small dressing area with shelves, drawers and a room safe. Extra luxuries included two fluffy robes, top of the line toiletries — from Aesop — natural sponges and loofahs. In the bathroom we appreciated the non-slip flooring of the large glass shower, well lit vanity and high powered hairdryer. The hotel has one of the largest horizon pools on the Caldera — pictured here — deep enough and long enough for a satisfying, short swim. 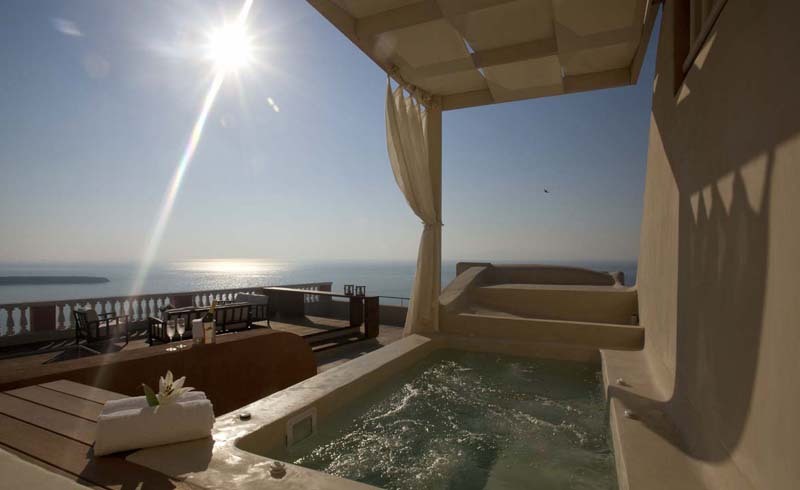 And some suites have enormous private, heated and jetted plunge pools. And here is the best part — some of those plunge pools are deep inside the suites — ready, if the romantic mood strikes, for a private skinny dip at midnight. 19 rooms and suites, ranging from €995 per night for two with private, heated and jetted pool, up to €3,495. We sampled a Grotto Suite available in mid summer 2018 for €1,245. There are a few rooms without pools available from €795 per night. Lunches and dinner are served poolside or on a shady pergola with a menu of Greek inspired specialties that changes daily. There's a treatment room and a small gym area with treadmill and cross trainer as well as a larger plunge pool for treatments and hydrotherapy. This was the only hotel we visited that was thoughtfully equipped with handrails on the steps. 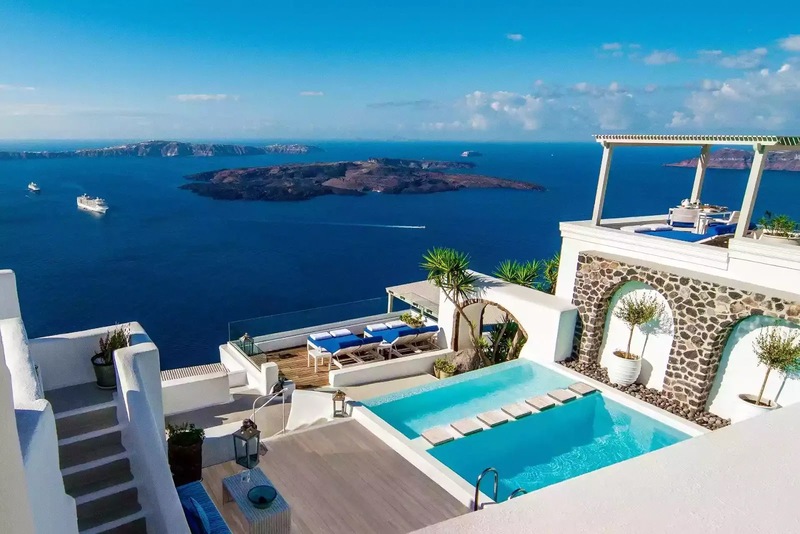 Andronis Luxury Suites, spacious suites and villas, spread down across the face of the Caldera from the highest point in Oia (pronounced EEE-yah for reasons mysteriously related to the Greek alphabet). Oia, the Northern most village on the island is where most of the high end luxury shopping is and it is where, at sunset, thousands of visitors swarm the narrow streets heading for the best view. But once inside your suite, the rest of the world simply does not exist. Our Superior Suite (about €1695 in 2018) was a long series of rooms including a large sitting room with striking designer furniture (patchwork leather sofa, found timber table, lots of illuminated nooks in the whitewashed, cave like walls) and French windows opening onto a sheltered terrace. Behind it, a super king-sized bed was surrounded with convenient electronics — power outlets, USB ports for charging devices, an iPod dock and traditional phone. And deep inside this tunnel of rooms, a dressing area with generous hanging closets, and a well lit bathroom and shower supplied with generous amounts of Apivita toiletries (a Greek luxury brand of bee products), natural sponges and plenty of towels, robes and slippers. We were greeted on arrival with a tray of treats — a watermelon and lime drink, a small pot of whipped chocolate mousse, a sweet muffin and a bottle of wine from the owner's own vineyards. About that terrace — beside the heated pool it includes a table and chairs where breakfast (ordered from an extensive menu the night before) is served, and a romantic double lounge bed. The pool was pretty much completely sheltered from prying eyes and the perfect place to soak and play while enjoying remarkable caldera views. 27 suites and villas ranging from €1060 to €3274, all with private terraces and indoor or outdoor plunge pools with jacuzzis. Visitors have rated the hotel's Lycabettus Restaurant one of the most romantic on Santorini. It juts out over the caldera on a promontory all its own. We never sampled it because getting down to it over wide, sloping stairs, paved with round volcanic cobbles and with no handrails was more than we could handle. Massages and treatments are available from the on-site spa. Most of the suites are reached over these same challenging stairs but fortunately, several at the top of the hotel are accessed by normal steps through the hotel's reception building. If you have issues with open stairs facing wide open spaces, be sure to ask for one of these rooms when booking. 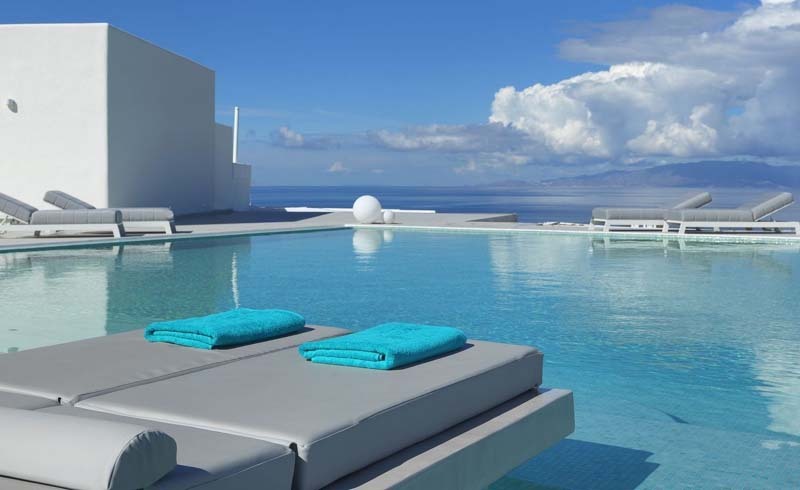 Santorini's newest hotel, The Myst Boutique Hotel opened in May 2018. Less theatrical and self-consciously romantic than many of its Caldera neighbors, this is a peaceful retreat for couples and friends who enjoy a more barefoot, casual style. The family-owned hotel sits on the edge of the plains of Tholos, less than a kilometer below Oia. It's near enough to the glamorous town for the occasional dinner out or shopping spree without the pressure of the crowds. The views are equally tranquil, ranging over agricultural fields and vineyards to a blue Aegean horizon. With the exception of the pool view rooms, most accommodations have west facing terraces and pristine, aqua tile-lined Jacuzzis. perfectly placed for watching the sun sink into the sea. After the morning heat haze burns off the sea, the bulk of mountainous Ios is visible from the pool and restaurant terrace. From its cool, white entry arch (a bit reminiscent of the gates of Mycenae) through the short flights of grey steps between clean white walls, the hotel's design and color scheme reflect a traditional blue and white Cycladic palette filtered and softened by a modern sensibility. Greys and taupes take down the usual blinding glare of white walls. And the sharp punctuation of turquoise — in the huge, square horizon pool (possibly among the biggest on Santorini) — is repeated in the beach towels liberally provided in various locations. Soft grey loungers surround the pool and double "floating" beds line one side of it. A lot of attention to detail amps up the comfort quotient. Beds have a leading brand of pillow-topped mattress; tiles in the shower, within and beside the hot tubs are non-slip, toiletries are by Greek luxury brand Apivita; there are French designer towels and linens; bedside USB ports, and flat screen televisions with cutting edge controls. Breakfast can be taken on your private terrace or the well shaded restaurant terrace. There' s a buffet selection of fruits, juices, breads, cheeses and cereals; omelette and waffle "stations" or you can order from a menu of cooked breakfasts. Light lunches and dinners, cocktails and wines are served in the outdoor restaurant or poolside. When we visited the brand new restaurant was still a work in progress. Salads were fresh and satisfyingly complex and the short selection of grills and pasta was well presented. 19 suites ranging in price from €432 to €725 per night with significant discounts available for pre-paid advanced bookings. All have private terraces with either pool views or private, outdoor heated jacuzzis. Just outside Imerovigli, the highest village on the Caldera, the Andronis Concept Wellness Resort rises out of the landscape, an earth toned mass more reminiscent of New Mexico than anything you'd expect to see in the Cyclades. 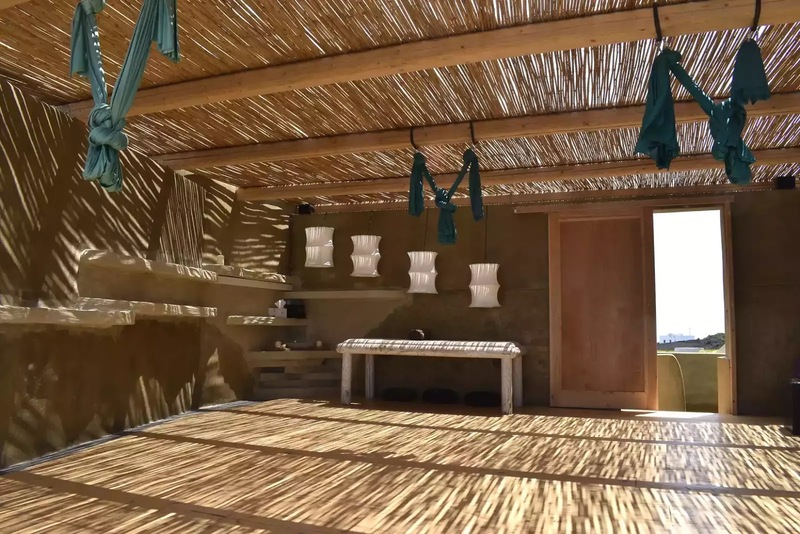 If your idea of holiday heaven is made up of massages, training sessions, body wraps, beauty treatments and yoga classes — including a 90-minute sunset yoga session in the beautiful rooftop studio pictured here — you will love this unusual spa resort/boutique hotel. Twenty-five suites, on two levels, all point at the sunset and have terraces with moderately heated, outdoor infinity pools, table, chairs and loungers. The centrally located spa offers an extensive, if somewhat pricey, selection of treatments and massages, using Valmond and Thalgo products. There's a steam room, cold and four-season showers and a windowless underground gym with an assortment of torture devices (can you tell we are not fans of gym equipment?). The main pool, located outside the spa area, is the largest on the island — a long narrow, unheated lap pool with a horizon edge that curves around a terrace lined with sun loungers. We particularly enjoyed the heated "cave" pool with waterfall adjoining the terrace. Food and drink, from light snacks to full meals, are served poolside, in the hotel's stylish, sunwashed Throubi restaurant or in your suite. We signed up for an open-air cookery class with Chef Miltos (£150 per person) and spent a few friendly hours preparing and sharing such local specialties as Santorini fava, tiny lamb meatballs (the secret ingredient is ouzo) and fresh salads. On the downside, because it sits above, rather than within the Caldera, the terrace areas can become windy and, in the early season, cooler than elsewhere on the island — making the private pool, the loungers and the table and chairs unusable. And one word of warning — try to book a room on the upper level. The hotel sits right on the popular clifftop footpath between Imerovigli and Oia. On busy days — especially when cruise ships are visiting the island — a steady stream walkers pass close enough to rubberneck, wave and even photograph guests in the ground level rooms. 25 suites ranging in price from about €1,200 per night for the basic "Cozy Suite" to €2,100 for the multi-level "Fabulous Suite" that sleeps four. The hotel is pet-friendly and in 2018 launched itself as the only family-friendly hotel on the Caldera. At the moment, there are no special child-friendly activities, menus or facilities but we did see a little boy having a great time with his Dad in the cave pool. From about two hours before the sunset, hundreds of people wielding Nikons, smartphones and selfie sticks swarm ruins of Oia Castle on the northwest tip of Santorini for the daily spectacle of the sunset. If you are a guest at the Oia Mansion, you can toast each other with cocktails and watch the spectacle — of both the sunset and the tourist multitude — from your private rooftop retreat, well above the melee and the noise. Or, even better, you can watch while floating in your nice warm hot tub, angled just perfectly to salute the last rays of the sun. The mansion, a distinctive, pink and blue confection on four levels, with spectacular views of the lagoon and the open sea, has been in the Nomikos family of ship captains and ship owners since 1870. It's a registered Greek Cultural Heritage Building, a neoclassical landmark and a very comfortable four-bedroom house. Oia Mansion accommodates up to eight very lucky people in a combination of period splendor (dining room, sitting room, captain's office) and traditional island style (minimalist, white washed bedrooms, most with outdoor access). Although it's a sort of villa, its rooms and facilities are booked and priced by the night so it positions itself as a boutique hotel. It's on one of the main streets of Oia and its gated front terrace, with table and umbrella, are passed by all and sundry. But that terrace is just for show. There's the well furnished roof deck and a lovely, coral painted interior patio for outdoor dining and lounging. And, in inclement weather, a formal dining room. The house is let on a bed and breakfast basis, and looked after by the lovely Lily — who offers island advice and makes all your arrangements — and her mother, who cooks fabulous breakfasts of eggs, breads, yogurt, pancakes with banana and chocolate, coffee, pastries and fruit salad. The house is well set up for small weddings and wedding receptions — including most licensed religious ceremonies (except Greek Orthodox which must be performed in one of Santorini's many churches). It's great for family reunions or groups of friends, but surprisingly, it's just as comfortable for a couple and priced similarly to other boutique hotels on Santorini. Four bedrooms sleeping eight. Prices in season range from €1,512 per night for two people with a minimum of two nights stay to €3,000 per night for 8 people with private transfers and a minimum of three nights stay. The house is available year round, including Christmas and Easter, with deeply discounted rates available in early spring and autumn. Children under 6 stay for free.